Lately there has been a plethora of newspapers and websites reporting on an alleged drawing of Rudy Vallée claimed to have been sketched by Warhol when he was 10 or 11 years old. One site - thestar.com - goes into considerable detail about how the drawing was discovered. 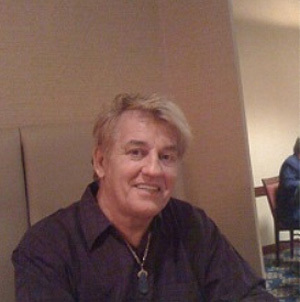 According to that account, Andy Fields purchased the work at a Las Vegas garage sale held by someone called Milton Longe that included memorabilia belonging to Longe's aunt, Edith Smith, who allegedly baby sat Warhol in Pittsburgh when Warhol was a child. The Warhol drawing was apparently "tucked behind" a drawing by Gertrude Stein that Fields purchased at the garage sale. According to The Sun newspaper in the U.K., Fields purchased the work in 2010, and "experts have hailed it the earliest known example of the late American's Pop Art - for which he became famous decades later." As it turns out, however, Mr. Fields has so far not produced any Warhol experts that have confirmed the work is by Warhol or who have "hailed" it as anything particularly important. In a recently posted video statement, Mr. Fields admits that although he took the sketch to the Antiques Road Show for appraisal, they told him off-camera that he would have to take it to the authentication board. But how can he do that now, he asks in the video, since the board has disbanded? But, apparently, the drawing was shown to the board. According to an article in the Huffington Post, "The drawing was shown to the Andy Warhol Art Authentication Board in New York - which refused to confirm it was genuine until more was known about it." In other words, they didn't authenticate it. As the board is now no longer accepting paintings for authentication, has Fields approached Christie's or any of the other major legitimate auction houses to have it appraised? Fields says in the video statement that "yes, it's been appraised and its been looked at by several people" but nobody is prepared to publicly say that it is a Warhol. But if nobody is willing to say publicly it is a Warhol, how can Fields claim that it is an authentic Warhol? 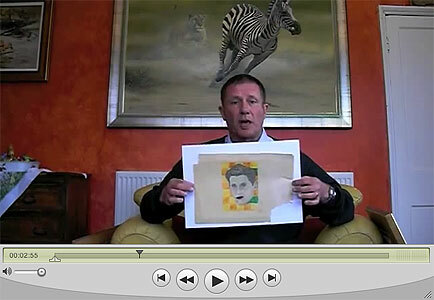 Andy Fields' "Andy Warhol Fact Video" here. 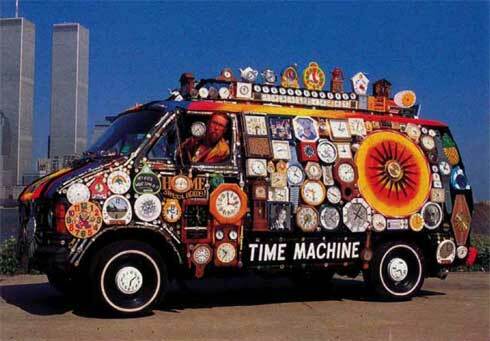 In the Daily Mail, Fields is quoted as saying, "I bought some sketches by Gertrude Stein at the garage sale and the Warhol work was actually behind one of these. When we were framing one of these I saw the Warhol work looking back at me there undiscovered." In his video statement, Fields says the following about the seller of the sketches, "He told us on the day in question that his aunt used to look after Andy Warhol...." But why were they discussing Warhol if the picture had not yet been discovered? The subject of the drawing is supposed to be Hopalong Cassidy - a fictional character created by Clarence E. Mulford - and played by William Boyd in movies. I've been unable to find an illustration of the fictional character or a photograph of William Boyd that corresponds to the alleged Stein drawing. Why on earth would the writer, Gertrude Stein, choose Hopalong Cassidy as a subject in the first place? Are we honestly to believe that Gertrude Stein (a writer rather than an artist), drew the picture of Hopalong Cassidy with such precision? Given her interest in cubism, if she did turn her hand to drawing, the pictures would probably be a lot more interesting than the one above which is more in the style of the alleged Warhol drawing. 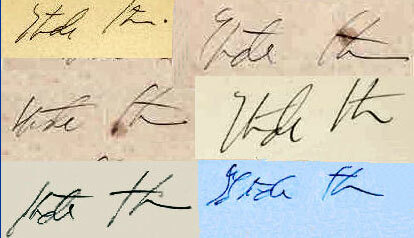 The seller of the drawings would have seen the signature that appears in the lower right hand side of the drawing. Why would anyone sell what they believed were authentic signed drawings of Gertrude Stein for $5.00 at a garage sale? The Channel 4 interview can be found here. Fields has also not explained why he thinks his 'Warhol sketch' is of Rudy Vallée. Who, specifically, told him that the picture was of Vallée and when did that person tell him? Profile pic from the Badoo page for "Milton Longe"
Milton Longe: "When I was younger I partied with Andy Warhol, Truman Capote, Leonard Sillman, and Noel Coward at Studio 54 and other places. My Alma Mater is Columbia University. I have travelled through Western Europe, Northern Africa, India, and Egypt. I taught at American University in Cairo, when I lived in Egypt. I purchased my first property when I was 19 years old and became a multi-millionaire in real estate before I was 21. I am partners in a major modeling studio. I am a strong believer of living in the moment." Milton Longe could not have partied with Noel Coward at Studio 54. Coward died in 1973. Studio 54 opened in 1977. Presumably, Mr. Fields has seen Longe's profile although he doesn't mention it in his video statement - assuming that as part of his extensive search for Longe he googled Longe's name. In regard to the claims made on the Badoo page, I have so far been unable to find a mention on the internet of a "major modeling studio" with Longe as a partner. Even if it were true that Longe partied amongst people like Warhol and Capote at Studio 54, so did a lot of people. It doesn't mean that Fields' painting is authentic - that is assuming that the Badoo profile is legitimate. Anyone can create a Badoo profile using any picture they want. Badoo will have the i.p. number of the computer of the person who posted that profile and from the i.p. number it should be able to identify who actually posted that profile and from what country the profile was posted. 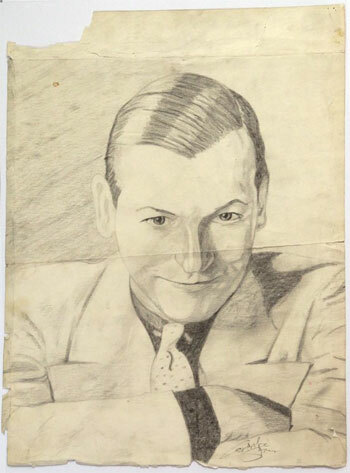 Mr. Fields claims that the sketch was done by Warhol when he was about 10 or 11 years old or c. 1938/39 - although in one section of his video statement he also mentions a date of 1940. The painting is signed "Andy Warhol." But Warhol's real name was Andrew Warhola. Would he have signed his childhood sketches at all at the age of 10 or 11 and, if so, would he have signed them with the name he later became famous by rather than his birth name? Fields has provided an explanation. According to the Daily Mail, "Mr Fields said he believes it is signed 'Warhol' rather than 'Warhola' because the artist only signed the work many years after he drew it." But how would he know that? I can't think of any instance where Warhol, as an adult, went back to his childhood drawings and signed them. 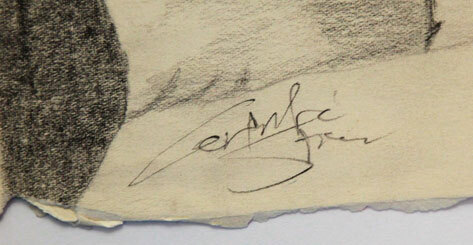 If he did sign Fields' drawing as an adult, he did it with a signature he didn't normally use for his art work. The signature on Fields' drawing does not match either of the two samples given in the catalogue raisonné of Warhol's signature. As you can see, although Warhol did sign it "Warhol," the signature on the Fields' drawing does not match the signature on the authentic drawing of Nick Kish. Referring to the signature on Fields' drawing, the Daily Mail notes that "Audrey Giles, a forensic handwriting and document examiner, was asked to assess whether the signature on the work was Warhol’s and concluded there were key elements of it which confirmed it was." In his video statement Fields also claims that he is not after financial gain and wants the work to go to a museum. Donating a Warhol to a museum is not very difficult. Has Mr. Fields rung the Museum of Modern Art in New York or the Andy Warhol Museum in Pittsburgh and offered the work to them? If not, why not? If so, what did they say? 6. $3 jumble sale sketch is £1.3 million Warhol - or is it? 7. The President of the RWA asks if Andy Warhol sketch is "authentic or a hoax"
Warhol star Holly Woodlawn will be appearing at the Camp/Anti-Camp festival in Berlin on 19 April. Other guests appearing at the festival include Douglas Crimp, author of Our Kind of Movie: The Films of Andy Warhol; cult star Vaginal Davis; and Taylor Mead who will take part via a video link. Following Mae West's credo that “too much is not enough,” the festival offers nothing but highlights, including an intimate evening with queer icon and Warhol superstar Holly Woodlawn and a concert-event by the sexually-transgressive cult performer Kembra Pfahler with her band “The Voluptuous Horror of Karen Black.” There will also be performances by New York downtown legend Carmelita Tropicana, the young mysterious club act Narcissister and the notorious Austrian artist-duo Jakob Lena Knebl/Hans Scheirl. Moreover the festival will feature presentations by international scholars such as Douglas Crimp, Diedrich Diederichsen, Elizabeth Lebovici, José Muñoz and Juliane Rebentisch, and by artists such as Bruce LaBruce and Richard Move. Every evening the award-winning homo-core queen Vaginal Davis will bring festival guests and figures from Berlin's cultural scene together for her talk-show performance “Vaginal Davis is Speaking from the Diaphragm.” Scholar Max Jorge Hinderer Cruz curated a section of the festival that explores the concept of tropicamp and focuses on tropicalism and internationalism in the avant-garde, Brazilian singer and Hollywood film star Carmen Miranda and contemporary performance impulses from Brazil. Tropicamp is a term coined by Brazilian artist Hélio Oiticica as a means of expressing his fascination for the anti-commercial tendencies within the 1960s US underground film scene (primarily the work of Mario Montez and Jack Smith). This section will offer an internationalist critique of camp discourse. Festival events will be complemented by films (by Hélio Oiticica and Jack Smith, among others), food performances (Foodgasm) and book and DVD-offers by b_books. Feel-good substances from the Voodoo Chanel Altar Bar will guarantee “Camp/Anti-Camp: A Queer Guide to Everyday Life” its uppers and downers. The festival is "A CHEAP production, in co-production with HAU and in co-operation with Arsenal – Institut für Film und Videokunst, e.V. (Berlin), Künstlerhaus Mousonturm (Frankfurt am Main), and Microscope Gallery (New York). Sponsored with funds from the Hauptstadtkulturfonds." Curated by Marc Siegel and Susanne Sachsse. Tere Tereba, who appeared in Andy Warhol's Bad, has written a book on mobster Mickey Cohen - Mickey Cohen: The Life and Crimes of L.A.’s Notorious Mobster. In addition to appearing in Bad, Tereba has written for Interview magazine and her account of Jim Morrison's time in Paris appears in The Doors: An Illustrated History. She is also an award-winning fashioner designer whose collection has been sold by Saks Fifth Avenue, Bloomingdale's, and Neiman-Marcus. Tere Tereba's website can be found here. There will be a memorial celebration of the life of Hoop - of Hoopmobile fame - at the Gershwin Hotel on April 3, 2012 at 7 pm. Hoop often contributed photographs to this site of Warhol-related events in New York. He died of cancer on 22 September 2011. The history of Hoop can be found here. 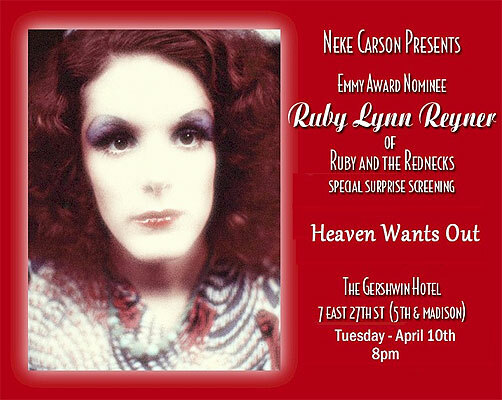 In addition to hosting Hoop's memorial, the Gershwin Hotel will also be hosting an evening showing of Ruby Lynn Reyner's film, Heaven Wants Out, with a a musical performance by Ruby. The film features Warhol stars Holly Woodlawn, Mary Woronov and Ondine. The event begins at 8:00 pm on Tuesday, 10 April 2012. The not-for-profit participatory arts organization, Figment, will be hosting a fundraiser celebrating Andy Warhol's Factory on 4 April 2012 at the Sag Harbour Studio in Manhattan. Tickets are $75.00 in advance or $95.00 on the door. 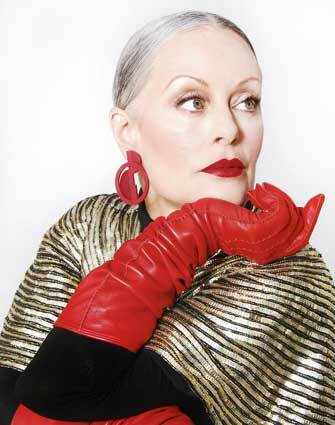 An interview with Warhol star Jane Forth by Victor P. Corona has been posted on the NY Art Beat website. Forth's films include Trash, L'Amour and Andy Warhol's Bad. When asked about her appearance in her first film, Trash, she replied "I needed to earn money to buy Christmas gifts that year, so I took the job.” After her film career with Warhol, Forth went on to become a make-up artist and was married for a time to Oliver Wood, the cinematographer for Sister Act 2, the Bourne trilogy and the Fantastic Four. (She is also the mother of Emerson Forth - a son she had with Warhol star Eric Emerson.) Included in the article are excellent photographs of Forth as she appears now, by Veronica Ibarra. Nicholas Chambers from the Queensland Art Gallery - Gallery of Modern Art has been appointed the Milton Fine Curator of Art at The Warhol museum. His appointment was made possible by a $1.5 million donation by the Fine Foundation (run by the Carnegie Museum Trustee Emeritus Milton Fine). Details on the press release here. A screening of two of Gregory Markopoulos' films, The Illiac Passion and Bliss will take place at the Anthology Film Archives on 4 April 2012 at 7:30 p.m. The cast of The Illiac Passion includes Andy Warhol as Poseidon, Taylor Mead as Elf, Jack Smith as Orpheus, Paul Swan as Zeus and Tally Brown as Aphrodite. The next evening, 5 April 2012, there will be a discussion with P. Adams Sitney on Markopoulos. Markopoulos' 80 hour film, Eniaios, which will be shown outdoors in the Peloponnese this summer. The discussion with Sitney will take place at The James Gallery at the CUNY Center for the Humanities at 6:30 p.m.
For me the inspiration for The Illiac Passion was derived from Aeschylus’ Prometheus Bound: from the multitude of impressions I had had from time to time of what the other two, lost plays of his trilogy, might have been like. And my own golden circle of inspiration not once ignored what I had read once as a student in a wonderful essay by Gordon Craig that the actor should appear naked upon the stage. Thus, I decided to film the protagonist shaped out of Prometheus naked. The season in New York was proper towards this endeavour, and I had no difficulty once I had cast the role in either filming the protagonist naked or in the most obvious difficulty, developing the film footage. But of the main characters in the Aeschylus, I only kept three: Prometheus, Poseidon, and Io. Prometheus was cast and in my own being thought of as Prometheus (thought he has no such name in the film proper) was portrayed by Mr. Richard Beauvais. Poseidon no longer arriving in a bath tub but riding an exercycle was portrayed by Mr. Andy Warhol... Andy Warhol’s footage was shot all in one evening, with Life magazine recording the event in colour stills; the stills have never been published. Two new books on the films of Andy Warhol are out now - The Black Hole of the Camera by J.J. Murphy and Our Kind of Movie by Douglas Crimp. Nars cosmetics will be launching a new range of of make-up inspired by Andy Warhol. The products will be launched in October in the states and in November internationally. Details in the Daily Mail here. A number of Andy Warhol's portfolios will be exhibited at the Dulwich Picture Gallery in south London from 20 June 2012 to 16 September 2012. Portfolios to be shown include Endangered Species, Flowers, Muhammad Ali and Myths. Andy Warhol: Fame and Misfortune by Justin Spring (with an introduction by Rene Paul Barilleaux) is out now.